BioSurplus is the pre-eminent supplier of quality, pre-owned laboratory equipment. 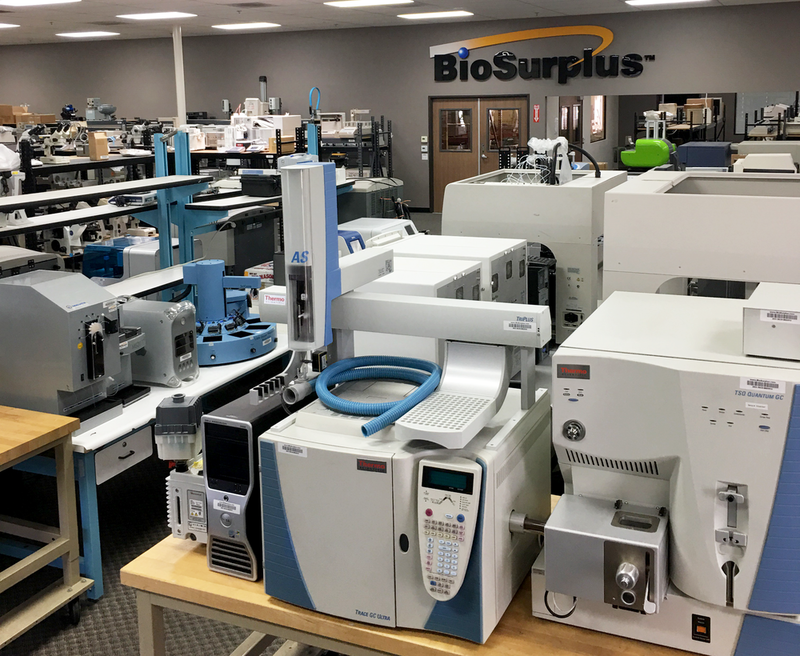 Based in San Diego, BioSurplus serves the international biotech community by providing turnkey solutions for purchasing, selling, and repurposing used equipment. We pride ourselves on being a primary resource for life science professionals as well as the sustainable and economical alternative to expensive new equipment. Read below to learn how working with us can benefit you, your lab, and the environment. Laboratory equipment in the BioSurplus showroom. Purchasing pre-owned equipment allows for significant savings. On average, we offer equipment at 30 - 50% of retail prices. We understand that start up costs are one of the biggest hardships a lab can face, so we work with their budget and find the right equipment at a price they can afford. We believe that funding shouldn’t be a barrier to your work, especially when you depend on your work to receive funding. One of the biggest misconceptions about purchasing used equipment is compromising quality for the sake of budget, but that doesn’t have to be the case. BioSurplus tests equipment to manufacturer specifications and can often test to the applications of the customer. Also, the majority of our equipment is surplus from working labs, not machines from storage. We want our customers to be just as confident in our equipment as we are. In addition to our extensive testing, we offer a 30-day money back guarantee with every purchase. We also facilitate relationships with third-parties who can provide extended service and maintenance contracts. Working with BioSurplus to either purchase or sell used equipment can have a major positive environmental impact. In 2016, the United States generated approximately 6.3 million tons of e-waste, almost 15% of the 44.7 million tons generated worldwide. An estimation study conducted by the UNU shows evidence that only 22%, or 1.39 million tons, was recycled. By either purchasing or selling used equipment through BioSurplus, you help reduce the contribution of laboratory equipment to that waste. Also, new equipment has hidden environmental detriments such as carbon costs and harmful manufacturing byproducts. Prolonging equipment lifecycles and limiting dependence on new equipment cuts back on the less prominent but still damaging environmental effects. We work with professionals from every life science segment from universities and non-profits to CRO’s and manufacturing companies. We also sponsor organizations like Women in Bio and Biocom that support the advancement of science and its members. Building or expanding a lab requires more than hardware, and we will provide you with as many trusted resources as we can. You can find us on our website at www.BioSurplus.com. If you are looking for equipment, have equipment to sell, or want to ask us any questions, email us at info@biosurplus.com or connect with us on Twitter and LinkedIn!